So my hubs got me an Ipad yesterday. Still getting used to it but I think I will love it! Anyone got some app suggestions for me? Love mine..did you get the 3 version? I started with 1 which does not have a camera like 2 and 3...any of them are great though.. I use mine all the time..aren't they fast? I got 2 - I could not bring myself to buy the 3 and spend that extra money. I just love it. It is very fast. From what I understand, there is not much difference between the 2 and the 3 except the camera is supposed to be better in the 3.. I would not have gotten a 3 if I would have had a 2..but my 1 did not have a camera and I wanted a camera. Hubs has the 2. Prayers for all monkeys in need - and PayPal for JSM and me please. Took our cars into the shop today and and I need a front brake job (thankfully the back ones were fine) and an oil change for a total of $350 and JSM needs two new tires for $225. Or you can wire my Cahse account directly. What happened after the lunch break on in-sessions yesterday about the enima lady? I want in on this too - They have more vacations in the last year than I have had in the last decade. GUILTY verdict in the trial of Baby Kate's dad! Then the feed went out. Hi Trimm good to see you. I haven't had a vacation in forever I want in too. Prayers for all that need them. Connie and her son were involved in a car accident yesterday. They were stopped at a stoplight and some woman slammed into them. Connie is very sore and Adam has a sore neck. Spent yesterday and this morning monitoring Connie. I think everything will be ok. Never a dull moment! I'm sorry to hear about the accident, and I hope Connie and Adam will be okay. Please keep us posted Sister. A few months ago my car was rearended when I had to stop at a yield for traffic to clear under a turn around. The guy just plowed right into me, and was very sorry and said he didn't even look. Well, I'm fortunate his car didn't push mine into traffic, his insurance repaired my car but boy, I was so sore for several days. Sister I am sorry to hear about Connie and Adams accident. Hope they both will be okay. Muffy sorry you got hit too. Yes you are lucky he didn't push into traffic. Glad you are feeling better. Last week daughter was coming home after dropping grandson off at school and stopped at a red light when the guy behind her was busy flippin some other driver off and didn't stop in time. She was okay. Only a little ding to her bumper. I am so sorry - man when it rains it pours in your neck of the woods. Prayers for all of you! I'm sure he wasn't happy about rear ending you either Muffy But seriously, sorry that happened to you! Sister, I'm so sorry to hear about Connie and her son. I do hope she goes to the doctor and gets checked even if she thinks she's ok, same with Adam. I too hope Connie and Adam get checked out by a doctor. Sometimes injuries aren't immediately apparent. Yes, I have learned the hard way - you should always be checked out after an accident. It is the only recourse for you if something happens after. Sister, I hope Connie and her son are okay. Keep us posted on her, please. Trimmy, it is SOOO good to hear from you - and what Digger is up to. I think we should all meet up when Urine comes to Bama to face Beth...what you think? Sister..glad that Connie and her son were ok! Geez! Always something huh? 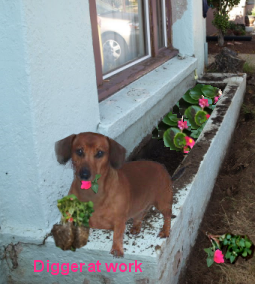 Digger destroyed new flower bed...send money. Page created in 5.199 seconds with 19 queries.